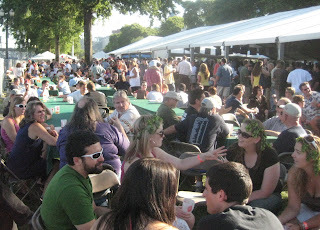 There's probably not much more I can tell you about this year's Oregon Brewers Festival. I already wrote a bunch of picks and pans based on Thursday and Friday visits. Our houseguests from Austin -- Bobnoxious and family -- didn't arrive until Friday evening, so we made yet another foray into the OBF on Saturday, along with the brave or merely foolhardy faction of the neighborhood beer gang. The heat and the crowds eventually ran us off, though Bob and I stuck it out until almost 5. Despite the crowds, I love the OBF. Get there early and have a great time. Saturday I tried to sample beers from some of the smaller Oregon and Washington breweries that I had missed on Thursday and Friday. Most of the offerings were disappointing, including several that I simply dumped out after a sip, but a couple of winners were the Kraken Imperial IPA from Old Market, and the Old Man River Oatmeal Stout from Riverport in far eastern Washington. Old Market's IPA was big, oily, and orangey, very well done. I haven't been a fan of their beer in the past, but their website brags about a new 15 barrel brewhouse, so maybe quality is on the rise there. Riverport is a new one on me, but their OBF stout was dark, roasty, and just right. The other mission on Saturday was the OBF Buzz Tent. The Buzz Tent offered a kind of PlatinumPlus festival experience, where a $20 punch-card offered 8 tastes of special beers curated by beerfest guru Preston Weesner. You had to show your card to get admission to the tent, which offered a shady, grassy respite from the bigger crowds in the main tents. With no lines -- or very short ones -- and some of the brewers on hand to discuss their featured beers, the only thing it lacked was restroom facilities. Only 1000 Buzz Tent tickets were to be available for noon-4:30 sessions on Friday and Saturday. But the tickets didn't sell out this year, and Saturday afternoon Ron Gansberg was standing at the gate trying to hawk some more of them, and on Sunday no ticket was required, just double tokens for tasters -- hey, that's cheaper than the $2.50/taste with the cards. It was an interesting experiment, and according to Preston it will be back with improvements next year. SPE of the taster pour. I definitely agree that the taster pour is much more economical than the full pour for $4. I haven't decided to blog the genious that was revealed to me a few fests ago, but I'll post it here in your comments section for those who choose to read it: The Floater Mug is the best deal of teh fest! Buy an extra mug @ one of the various locations early, and take 2 mugs to the same beer and pay for 2 separate tasters for $2. Our crew regularly had near full pours whence the 2 tasters were combined for a mere $2. Works great @ the Holiday Ale Fest and Organic Beer Fest as well! ASG: Now that is a good system. Prost to cheapness!